The 1970s were a thriving time in the world of physics, heralding such milestones as the development of the Standard Model and the discovery of the bottom quark. Now scientists at Fermilab are bringing some experimental pieces of that era back - bubble chambers and fixed-target physics. 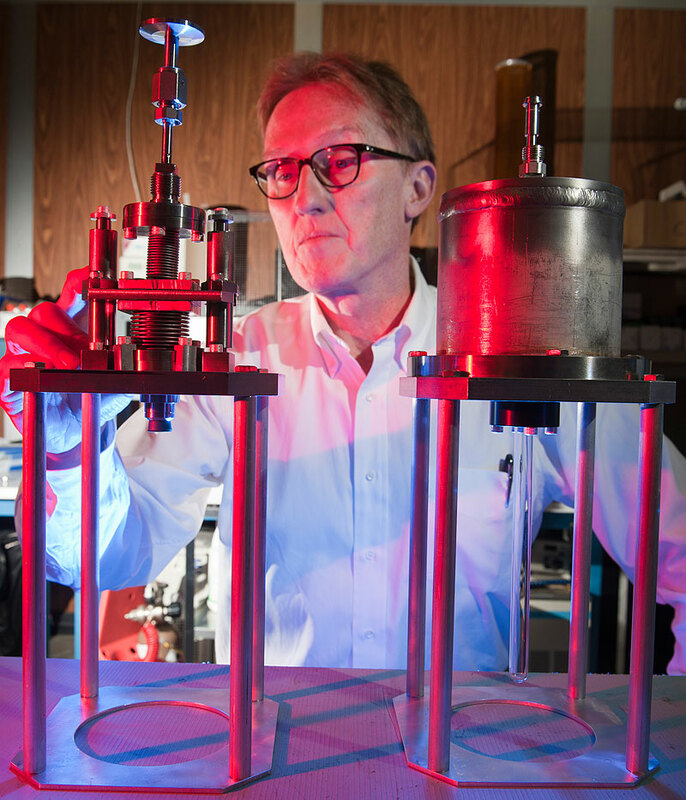 Peter Cooper, a Fermilab physicist, is heading a new experiment calibrating the classic bubble chamber technology, which is used today to search for dark matter. The Chicagoland Observatory for Underground Particle Physics (COUPP) collaboration looks for bubbles in chambers filled with a compound containing carbon, fluorine and iodine. The fluid is superheated beyond the boiling point but has no rough surface to form bubbles. When a specific type of particle interacts in the chamber, it can deposit enough energy to boil the fluid and make a bubble. Electrons do not produce bubbles, while a dark matter particle interacting with a nucleus can - making this the key for dark matter detection. 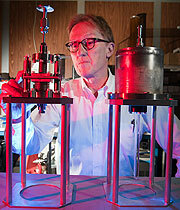 "When a bubble forms, we notice it in the pictures," Cooper said of the chamber technology. "The bubbles in the fluid are slow enough that high-speed cameras will capture the changes through continuous still shots. We're making the world's most boring movie." However, scientists are uncertain about the energy it takes to create a bubble in the chamber, which directly influences the sensitivity of the experiment. The new experiment, named COUPP Iodine Recoil Threshold Experiment (CIRTE), will calibrate the energy threshold of the COUPP bubble chambers so that the COUPP dark matter results are on a firmer foundation. Scientists will fire pions, the lightest meson, in the Fermilab Test Beam Facility at a tiny pen-sized bubble chamber to measure how much energy needs to be deposited in the chamber to form a bubble. The CITRE collaborators will use a fixed-target technique called elastic scattering of pions. The pions interact with iodine, the target nucleus in the COUPP bubble chambers with the most sensitivity to the most popular dark matter candidates. The pions are surrogates for dark matter - the bubble chamber sees them both in the same way by observing the bubble from the recoiling iodine. Unlike dark matter, however, pions can be easily observed with other detectors on both sides of the bubble chamber, allowing COUPP scientists to know how much energy the pion gave to a scattered iodine nucleus. Cooper and his team are currently running preliminary beam tests on solid carbon, fluorine and iodine targets to ensure that they understand how the experiment will work, in preparation for putting an actual bubble chamber in the beam. By watching how the pions interact with each target, they can determine how the pions should behave once the bubble chamber is in place. However, the bubble chamber will only be able to produce one measurable bubble per beam spill, or one cycle of the accelerator. After the one bubble appears, the entire chamber needs to be recompressed in order to reset the contents. The current COUPP chamber operates at the underground SNOLAB in Canada. Being deep below the surface allows scientists to suppress background events, such as those from cosmic rays. That bubble chamber is already setting limits on dark matter interactions that approach the best in the world. But they are hampered by the uncertainty on the energy threshold. With a little help from CIRTE, the COUPP experiment will be on a solid foundation as its search for dark matter increases.